Oh my gosh – did I ever make a mess!! I had to move hundreds of fabrics from our little hallway into my office/sewing room so that our new dryer could be delivered. 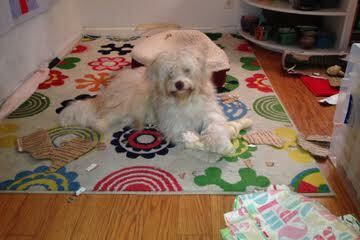 I had brought my puppy, Kevin, downstairs to “help”. He thought that finding boxes and shredding them to bits and pieces would be his contribution. So that just added to the massive mess. Poor Timmy just curled up in the corner of the window seat to watch this disaster. Take a look at this photo! Pretty much a pigpen, isn’t it? 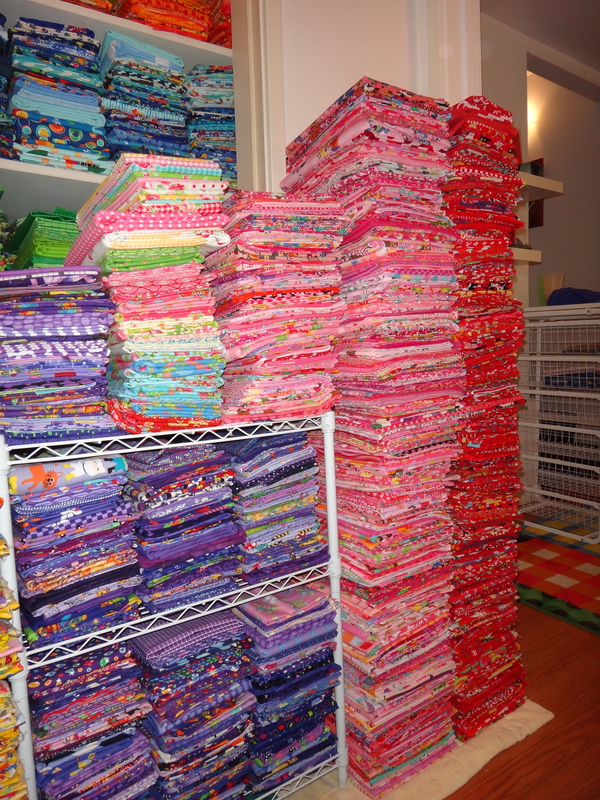 So for two days I folded, stacked and moved those hundreds of fabrics back into the hallway. 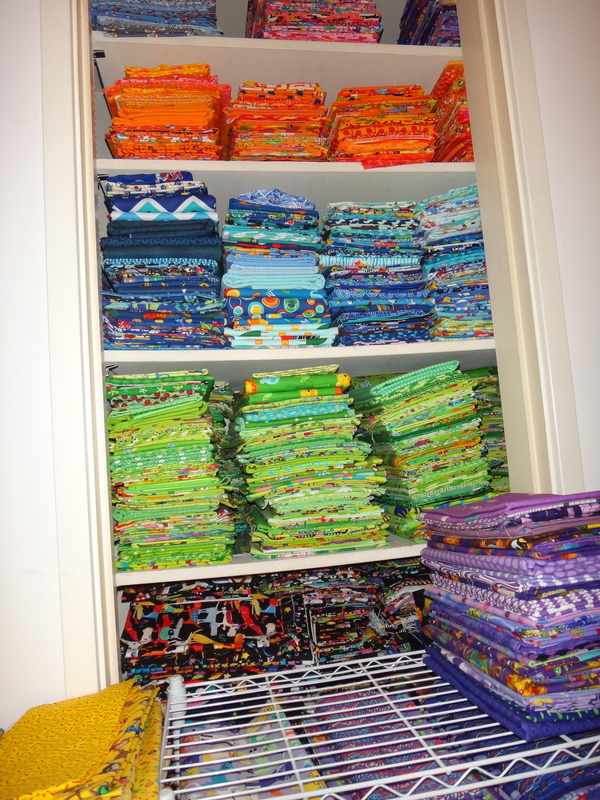 But before I could make the move, I had to refold and reorganize my fabric closet because it was a disaster too! As I was digging into fabric piles that were two piles deep, I rediscovered some beautiful pieces. That was very exciting! But then I also found some fabrics that were just awful! What was I thinking when I bought some of them? Yee gads! It must have been those late night purchases when the brightness on my computer screen was severely compromised. I can’t explain those purchases otherwise. Tee-hee!!! I mean I even found mustard and pea colored birds – they were dreadful! 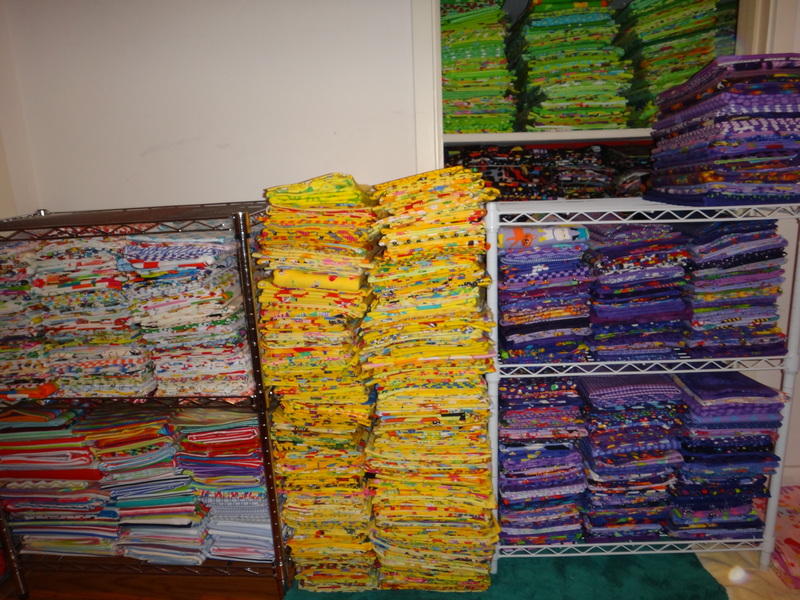 Here are some shots of the stash once I got everything refolded and fixed my color piles again. 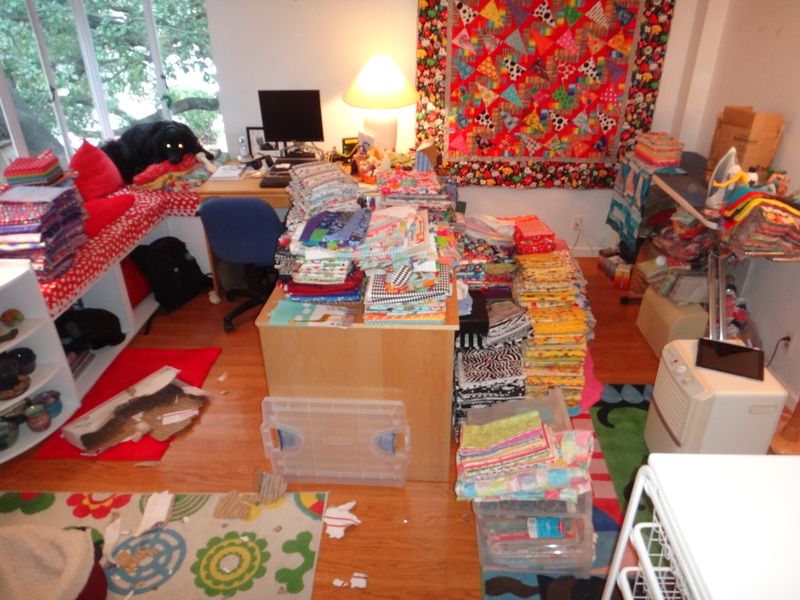 And lastly – my sewing room/office is basically back to normal. PHEW!!!! I have been doing some sewing as well. Here is the center of a simple house quilt. The photo was taken inside so its a little harder to see the colors, it is actually pretty bright. I decided that all of the houses needed to be made from stripes and that the doors would all be red. I also wanted to use a fat quarter pack of checks, so all of the roof tops came from those. Then I used little 2″ squares (fussy cut) for the windows. Those fabrics are all small Japanese prints. I just love those! 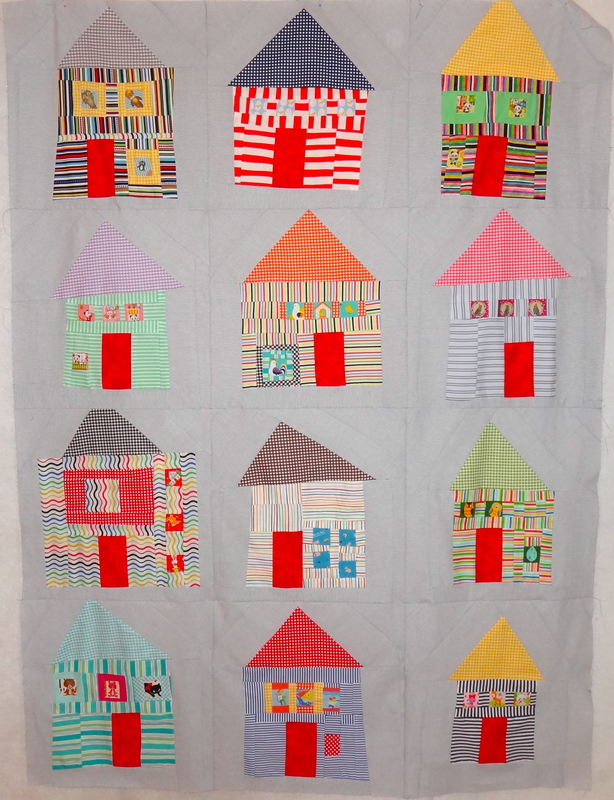 I always love making houses – I think it was all of my Freddy Moran training!! She always told us to make houses that would shock the neighbors! I love seeing the photos of your stash. It is so colourful!! I don’t envy you the work involved in shifting, sorting and stacking though. Glad you made some good discoveries. The houses are great with their red doors!! Happy color explosion in a fabric workshop with black and white Timmy and Kevin for contrast! 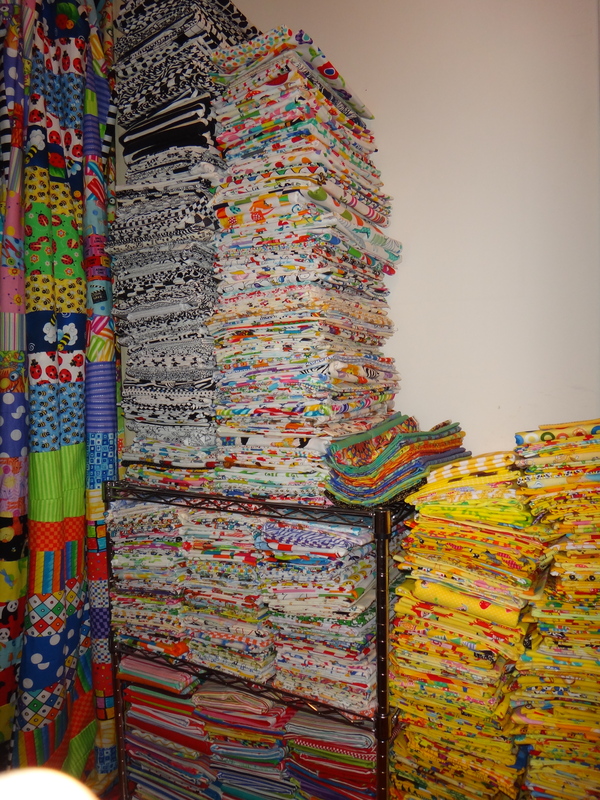 I just love looking at your fabric stash. I had to show my husband the pictures so he would understand that quilters just can’t get enough fabric.LOL. 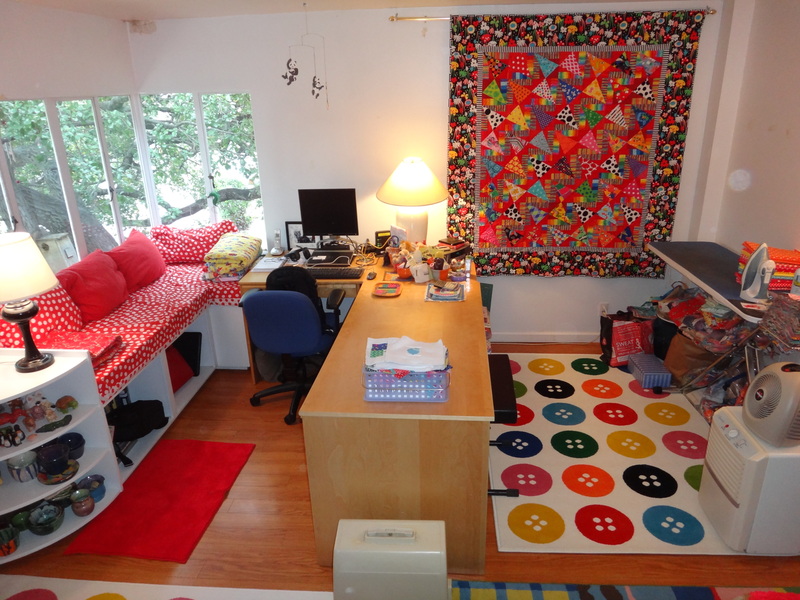 The house quilt is adorable and I love your sewing room/studio. Gorgeous! Kevin s like Rosie…loves to destroy (play) with boxes. 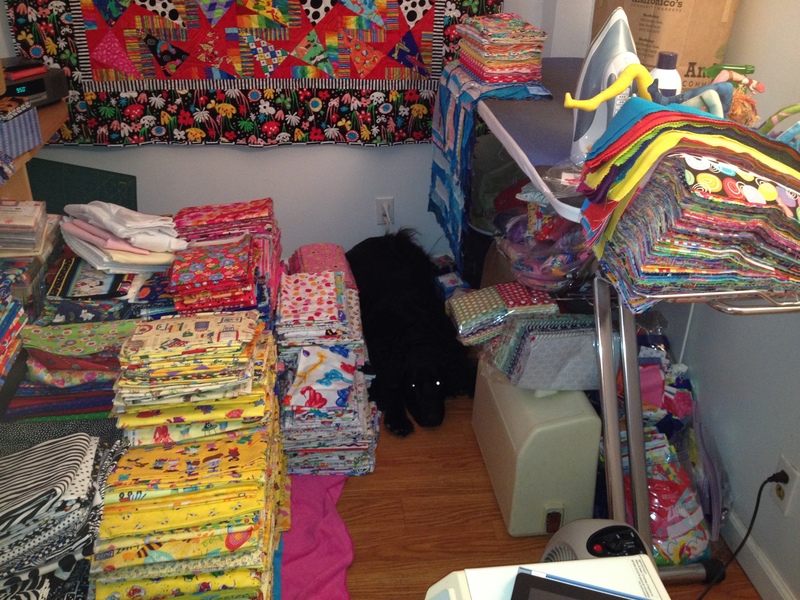 I loved seeing all your beautiful fabric and your sewing room. I’m coveting your IKEA button rug. Kevin the puppy made a very good helper. My youngest pug Larry could definitely help him out. He is very good at taking old tissues out of the trash can! Hi Christine, thanks 🙂 I still have it on my design wall. I have been thinking about the borders. Since the house blocks are pretty simple, I’m thinking that I need to have a “busy” border. Have a great day! Thank you for sharing these pictures! You have inspired me to tidy my own sewing area. Also more positive about my own stash! 🙂 Have a great day. Hi Sarah! I always get a big kick out of my stash 🙂 I love to re-discover fabrics that I’ve forgotten about. Can I come play at your house?! What an amazing stash! Hi Joanna – thank you for stopping by 🙂 And yes, you can come play at my house hee-hee. Nothing better than a quilting play-date!